Growing your own potatoes is actually one of the easiest things you can do, and is a great way for a beginner gardener to learn about growing vegetables! 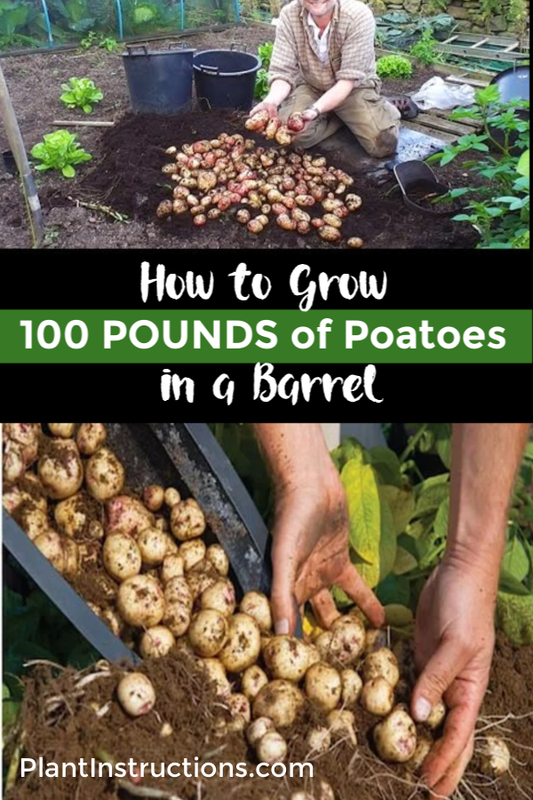 This guide will show you how to grow a hundred pounds of potatoes in a pot or barrel from start to finish! 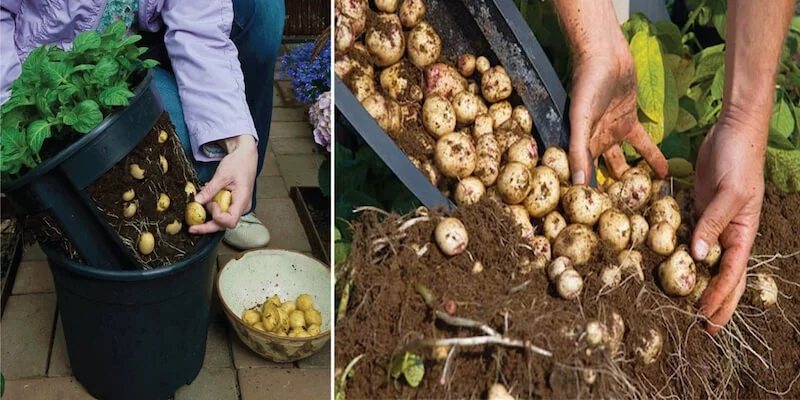 This 4-step guide to growing 100 pounds of potatoes is so easy, that anyone can do it! And in no time, you’ll have a healthy bountiful potato harvest! To do this, you’ll need a pretty large container, such as a 50-gallon barrel or a commercial potato planter, but almost any 2-3 foot tall container will work! Be sure that your container has drainage holes and if not, drill some holes yourself. Be sure to also drill some holes on the bottom sides of the container: good drainage is critical for a healthy potato harvest. Next, clean your container thoroughly using a mild bleaching agent. First, decide which variety of potato you’re going to plant! There are many different varieties, so choose something that you and your family will love! You should be able to find seed potatoes (potatoes with sprouts on them) at your local nursery early in the growing season. Alternatively, you can also make your own seed potatoes by setting potatoes in an egg carton with the buds facing up. Place them cool place with little light and wait for them to sprout. You can also place tubers in a paper bag to encourage sprouting. Fill the bottom of the container with about 6 inches of loose potting mix and compost. Add some seed potatoes on top of the soil, and be careful not to over-crowd them. Leave small spaces in between each potato. Backfill with another 6 inches of soil and compost and water the soil. Keep the soil damp at all times, but be careful not to over water. Add more soil once the seed potatoes have about 6-8 inches of foliage. Cover about one half to three quarters of the visible stems and foliage. Keep repeating this process of covering the stems and foliage every time new growth occurs. Moist the soil after every covering. 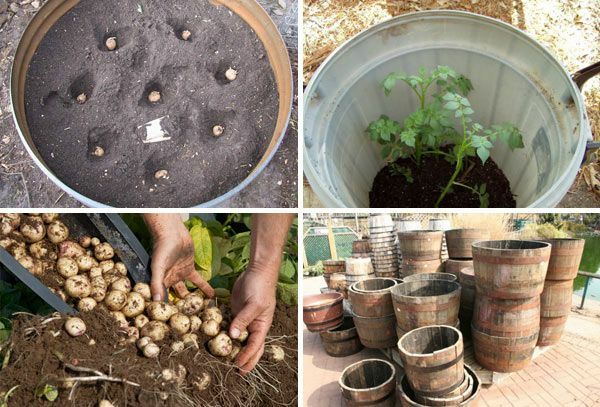 Keep covering with soil until you reach the top of the barrel. Once the plants start to flower and yellow (about 10 weeks), you can harvest your potatoes! Slowly and carefully dig down with your hands and inspect the top layer. If you feel the potatoes are ready, simply dump the entire barrel out onto a tarp and enjoy your harvest! Repeat as needed! How to Grow a Hundred Pounds of Potatoes in a Pot was last modified: February 5th, 2019 by Aniela M.